Offering a powerful yet intuitive method of setting up your wireless network, the unique speed and power of this sleek 11ac wireless router is certain to keep the entire home up and running with ease. 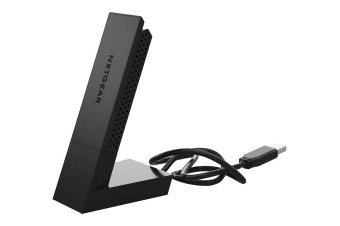 This Netgear AC1200 WiFi USB 3.0 Adapter with high-gain antennas wirelessly connects your notebook or desktop computer to an 11ac network for lag-free, multiple HD streams throughout your home. Perfect for online gaming, the reliable connection to the Internet ensures your game won’t be ruined by lag. Unique Netgear Genie technology is also included, so you’ll have no issues getting your network up and running in no time!